After losing two members, The Posies continue to grow. On the other side of the world, in a Manchester pub, The Posies' Ken Stringfellow struggles to be heard over noisy pint-hoisting patrons and a wavering Wi-Fi connection. Before the call cuts out, he exclaims, "We're the crème brûlée of indie rock!" That might sound like a bit of bravado. Take it as a metaphor for undergoing the fire of adversity to create the esteemed alt-rock/power-pop band's musical confection, after Stringfellow and longtime friend and musical partner Jon Auer watched bassist Joe Skyward and drummer Darius Minwalla pass away within 10 months of each other. Minwalla, who had played in a number of other bands—including backing Hugh Cornwell of British punk legends The Stranglers—died unexpectedly in May 2015, during the recording of The Posies' newest album, Solid States (Lojinx). "Darius' death really threw us into turmoil," recalls 48-year-old Stringfellow. "We spent several months wondering what to and if to do, at all. Eventually we realized resuming work on the album was the way out of the emotional crater that we were in." Skyward, also known for playing with Sunny Day Real Estate, had been battling cancer for several years, and lost the fight in March—48 hours before a planned Posies tour. 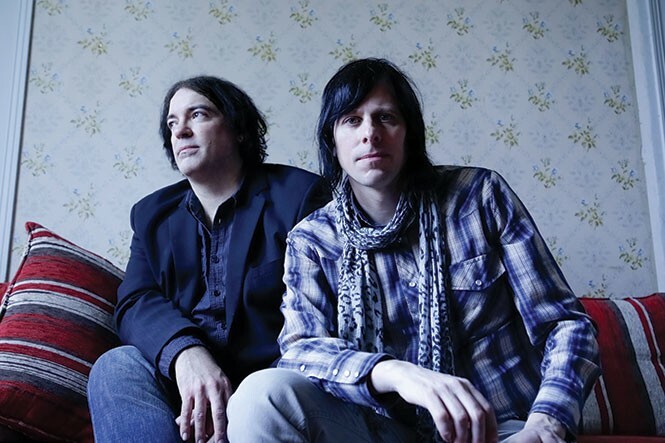 The Posies are no strangers to losing bandmates. Months before the release of 2010's Blood/Candy (Rykodisc), Stringfellow and Auer lost Alex Chilton, leader of renowned power-pop band Big Star, which the pair joined in 1993. Chilton passed just three days before a highly anticipated performance at South by Southwest in Austin, Texas. The show morphed into an all-star tribute, with the likes of John Doe, The Watson Twins, Chris Stamey, Mitch Easter, Evan Dando, Sondre Lerche and R.E.M. 's Mike Mills joining Stringfellow, Auer and drummer Jody Stephens for a poignant set of Big Star hits and stories. Although Big Star continued to perform on occasion, including complete performances of their masterpiece Third, the band is now essentially inactive. Not so for The Posies, who originally formed in Bellingham, Wash., in the late '80s, and whose power-pop hits "Dream All Day" and "Golden Blunders" provided counterpoint to the grunge of the '90s. The loss of Minwalla and Skyward became part of their agenda to reinvent themselves. "The band has undergone a radical transformation musically, which we'd planned as soon as we embarked upon making this album," Stringfellow says. They enlisted Frankie Siragusa—who'd played on Stringfellow's 2012 solo release, Danzig In The Moonlight—to replace Minwalla, and complete Solid States. Since The Posies have a reputation for setting the bar high, it's no surprise that Solid States is lyrically dense and sonically deep. Like Stringfellow says, the band tinkered with their sound, using a laptop, as well as a new synthesizer and effects pedals. The upshot is that the band's guitar-based sonic palette is lusher than ever. Sometimes the more modern touches, like the electronics on "Radiance," can slightly overwhelm the melodies or, with its smoothness, make them seem slight. But on the best cuts, like the single "Squirrel vs. Snake," the atmospherics enhance the subtleties of the lyrics—just like on classic Posies tracks. Thematically, much of the album centers around familiar pop topics of romantic intrigue, but "Squirrel vs. Snake" adds a political snipe: "Don't trust some guy that says he needs to be relied on/ or a government that says you should be spied on." And naturally, some songs concern the loss of their friends. Stringfellow says several songs are about Minwalla, including the haunting sing-along "Unlikely Places," where Auer sings, "I've been looking for you in unlikely places." The album's themes of healing and love still find relevance today, especially in light of recent darkness. In keeping with mixing things up, The Posies are currently on a "Secret Pop-Up Shows" tour, begun earlier this year in Europe, where they perform for crowds as small as 10—and no larger than 100. They seem to be part of a recent "hip" trend of name artists playing small, intimate performances in private homes, but there's more to it than that. "In the age of ubiquitous, 'everything all the time'—drones delivering your whims to your balcony, music streaming from any device you choose—we made everything more difficult," Stringfellow says. "You can only get the physical album at shows. You have to buy a ticket to the shows to find out where they are. ... It's fun to play places that aren't the usual go-to rock club in town, and make a unique experience for each show." Seeing The Posies at a secret show is like having a crème brûlée prepared tableside at a small restaurant: a treat that's sweet but also a bit intense, even incendiary. Not to mention cathartic and commiserative. Stringfellow says The Posies' sets always include the songs about Minwalla, and they talk about him and Skyward every night.